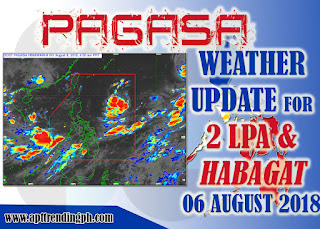 Home PAGASA PAGASA Weather Update for 2 LPA and "Habagat" 5:00 AM August 06, 2018. 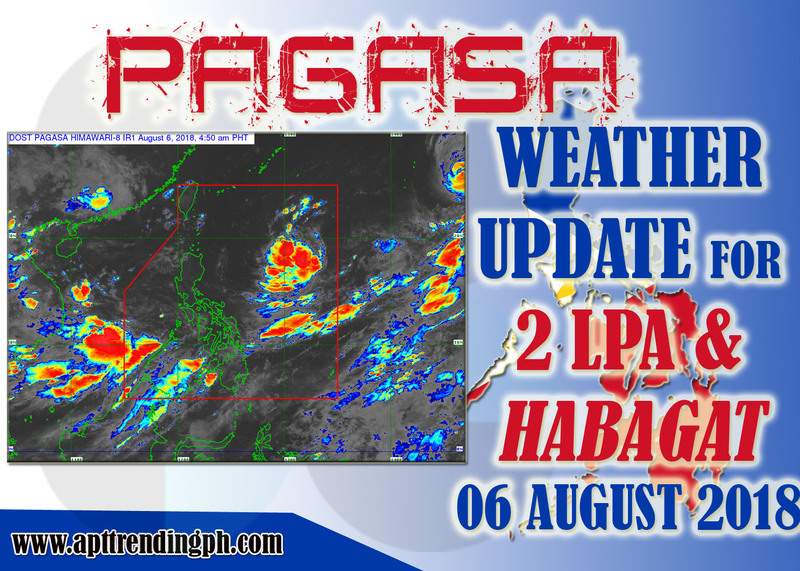 PAGASA Weather Update for 2 LPA and "Habagat" 5:00 AM August 06, 2018. SYNOPSIS: At 3:00 AM today, a Low Pressure Area (LPA) was estimated based on all available data at 1,280 km East of Tuguegarao City, Cagayan (17.7°N, 133.8°E). Meanwhile, another LPA was also estimated based on all available data at 615 km West of Subic, Zambales (14.3°N, 114.6°E). Southwest Monsoon affecting Southern Luzon and Visayas. (Forecast Areas: Visayas, Palawan, Occidental Mindoro) Western Visayas, Palawan and Occidental Mindoro will have cloudy skies with scattered rains and thunderstorms, while rest of Visayas will have partly cloudy to cloudy skies with isolated rains or thunderstorms due to Southwest monsoon. Moderate to strong winds from the Southwest will prevail over Palawan, Occidental Mindoro, and Western Visayas with moderate to rough seas. Moderate winds from Southwest will prevail over Eastern and Central Visayas and the coastal waters will be moderate. NCR Weather Situation: Cloudy skies with scattered rains and thunderstorms will be experienced over Zambales, Bataan, Batangas and Cavite.Partly cloudy to at times cloudy skies with isolated rainshowers or thunderstorms will be experience over Metro Manila and the rest of NCR-PRSD forecast areas. Light to strong winds blowing from southwest will prevail and the coastal waters will be moderate to rough. Zambales, Bataan, Cavite, Batangas, MIMAROPA, and Western Visayas will experience Cloudy skies with scattered rains and thunderstorms due to Southwest Monsoon. Flooding and landslides due to scattered rains or thunderstorms. Metro Manila, Bicol Region, and the rest of CALABARZON, Central Luzon, and Visayas will experience Partly cloudy to cloudy skies with isolated rains or thunderstorms due to Southwest Monsoon. Possible flashfloods and landslides due to moderate to occasionally heavy rains or thunderstorms. Mindanao and Northern Luzon will experience Partly cloudy to cloudy skies with isolated rainshowers due to Localized thunderstorms. Possible flashfloods and landslides due to moderate to occasionally heavy rains or thunderstorms.